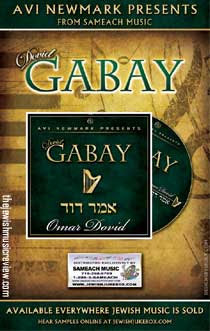 Dovid Gabay's follow-up album to his highly acclaimed debut recording entitled "LeGabay" is finally here. Since the release of his first album, Dovid has become one of Jewish music's most requested singers at weddings, concerts and other major events. As with his first recording, this album features a mix of songs that satisfies the tastes of all Jewish music fans. "Hagomel," a disco composition by Yossi Green, has already received tremendous acceptance within its first few days of radio play. The title track "Omar Dovid," composed by rising composer Elimelech Blumstein, is sure to satisfy the all time Jewish music fan. Returning on album #2 is Rabbi Avi Kula lending his beautiful ballad "Rachem" which has the heartz that is required in a Jewish music hit. Yitzy Waldner also joins the project composing "Zaroh" and the music for the English song "The Letter." The Letter has a beautiful message - It is a letter between two friends who have grown apart due to the progression of life and the request between them to daven for each other. This concept is imperative in Jewish life and we all must understand how, if Klal Yisroel not only davens for themselves but for the betterment of life for each other, our tefilos will reach the highest levels of Shamayim and the answers to our tefilos will be revealed.